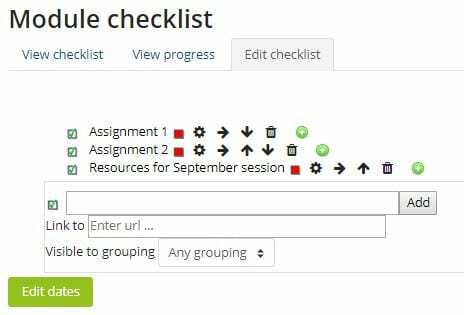 With the new upgrade to Moodle 3.4, there is a new checklist activity available for staff to use. The checklist activity allows the teacher to create a checklist / todo list / task list for their students to work through. This could be useful for enabling students to track their own progress with their assignments and hand in dates as well as other activities they may need to do. 1. The checklist can be graded, although it’s probably best used as a way for students to keep track of their progress in the module or as a reminder tool. 2. 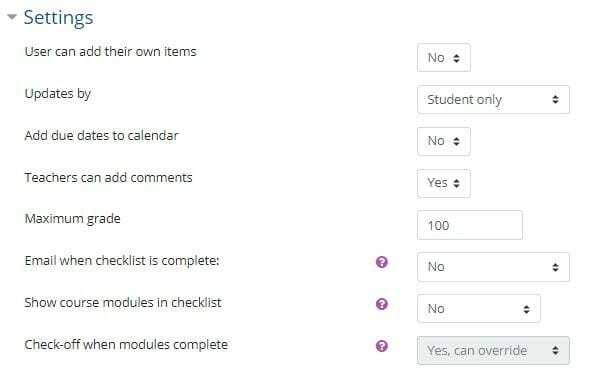 To create a checklist, visit the module page where you’d like to add the checklist and click on the cog at the top right-hand side of the screen. Turn editing on. 8. You can also set activity completion options, within the activity completion section. You will then be able to enter your checklist items, by typing directly into the box and selecting ‘Add’ – if you like, you can also include a URL link. You can then choose if you want to make it additionally visible to groups and there are options to edit checklist items or move them up or down the list. On the top tab there are further viewpoints if you want to view the checklist and progress to see how many students have used it.